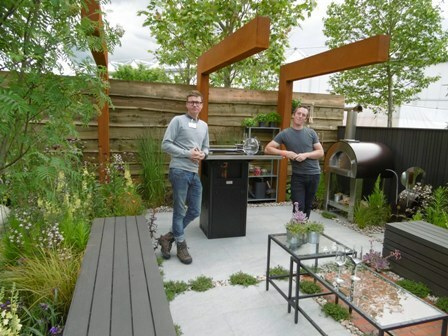 Garden designers have battled the elements to ensure their exhibits are ready for BBC Gardeners' World Live 2016 which runs at Birmingham NEC from June 16 – 19. Two Show Gardens scooped gold medals – Health for Life Community Garden, designed by Owen Morgan of Mosaic Landscape Design and constructed by Big Fish Landscapes with support from The Conservation Volunteers and Mondelez International Foundation, and Eat and Shelter, designed by Michael McGarr and built by MJM Landscape Design and Build. 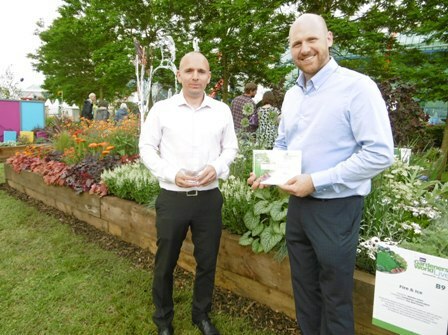 Health for Life was named Best Show Garden. Designed as a celebration of community gardening and the work of the Health for Life programme, the exhibit demonstrates the variety of activities a community growing space can accommodate. Alongside raised bed planters full of tasty vegetables are apple trees, an outdoor kitchen and meeting space and a homemade greenhouse. 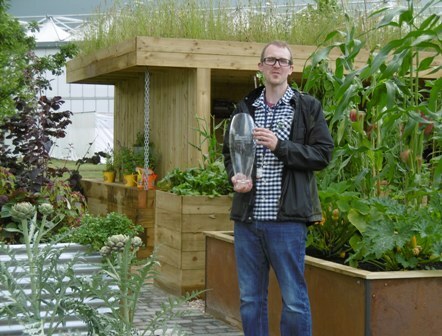 Eat and Shelter took the title Best Constructed Garden. It was designed for a young couple living in a modern home and features an outdoor kitchen with planting to both attract wildlife and be a pleasing backdrop for outdoor dining and relaxing. 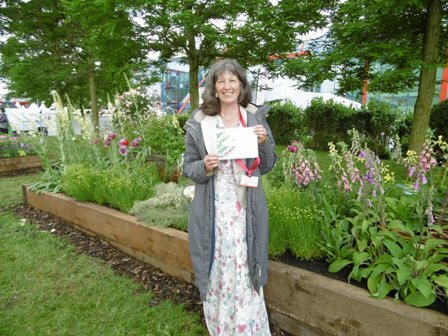 Awards were also given for Beautiful Borders, small gardens which this year had the theme of literature. A gold medal and the title 'Best Border' went to Fire & Ice, designed by Martin Lines and constructed by James Lanwarne of Lanwarne Landscapes. Sponsored by The Red Cross, the design was inspired by Robert Frost's poem Fire and Ice which serves as a reminder of the humanitarian crises across the world. 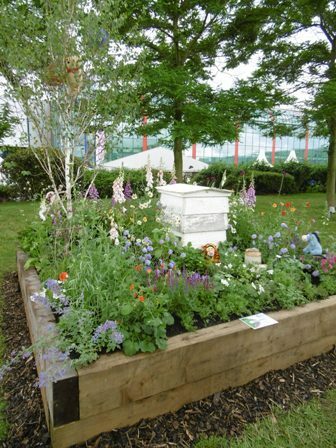 A gold award was also presented for Winnie the Pooh and the Honey Tree which was named The Border that Best Interpreted the Theme. Designed by Julie Haycock, the exhibit celebrates the 90th anniversary of AA Milne's Winnie the Pooh books. Winnie can be seen in a tree looking for honey, with his friends Tigger and Eeyore near a beehive which is surrounded by nectar-rich flowers. 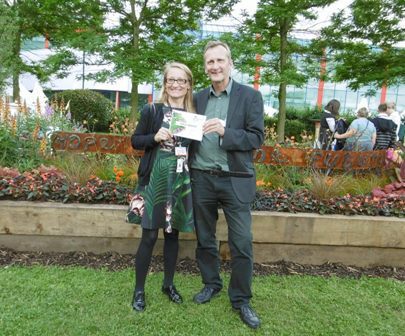 A third gold was won by Jess Usher for I Know A Bank Where The Wild Thyme Blows, a celebration of the works of William Shakespeare. The semi-wild and romantic planting evokes the essence of the love lines in A Midsummer Night's Dream. The fourth and final gold medal went to Hope Forms The Future, designed by Michelle Buxton and Mike Baldwin. Based on the poem MS by Rose Robinson, the border incorporates the National MS Society colours of orange and black and evokes the emotional journey of those affected by Multiple Sclerosis, along with their continued strength and 'Hope For The Future'.